Hubby and I were looking for something new and decided to try Cholita. It’s in the ill-fated 10 01/Miss Behavin spot (what a terrible name). We went in slightly worried just because of the past experiences but were pleasantly surprised to see they have revamped the interior and that it was comfortably crowded even before 6:00. 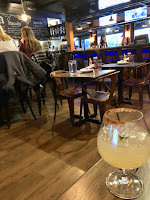 There is a large bar area in the restaurant that was full, and there is a good-sized seating area that was about half full with families as well as groups of adults. Our server was prompt and got us a drink quickly. I also liked that she didn’t have us order everything at once, as the food comes out pretty quick. 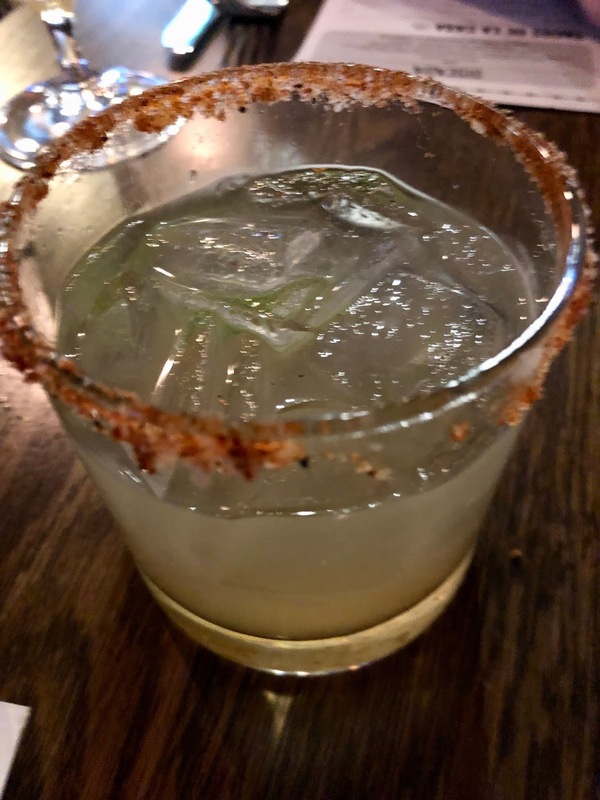 We each got a Cholita margarita (regular is $8, grande is $13). They were very tasty. They had a nice tart taste and weren’t overly sweet, which I appreciate. They use a bit of seasoning in the salt on the rim, which make it have a little kick. 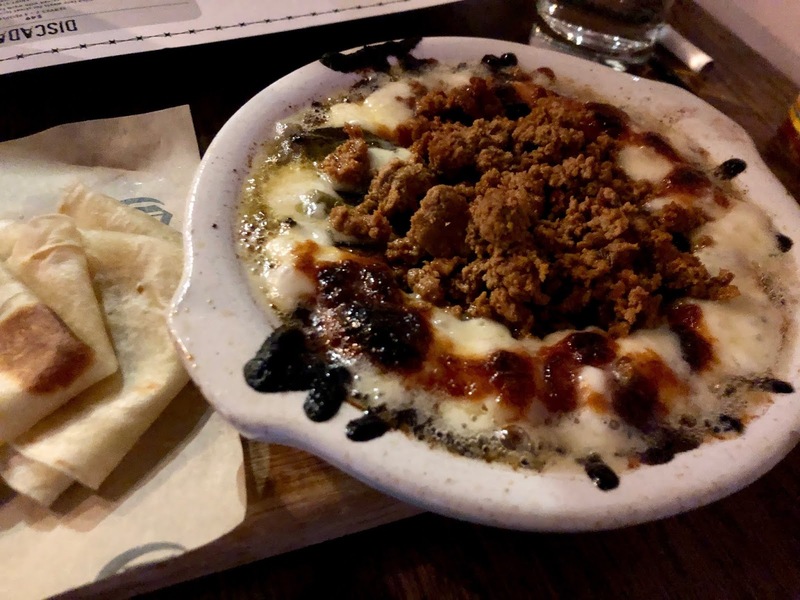 We also started with the queso fundido ($8) and added the chorizo option ($2). They serve this extremely hot bubbling cheese with tortillas to fill with the cheese and meat. It was really good. The edges of the cheese kind of burn on the little bowl it is served in. That crispy edge peeled out and put in a tortilla was delicious. I liked the chorizo, and appreciated that it was ground so it was easy to eat, but I thought there was maybe just a little too much of it. It sort of overtook the cheese in quantity. It all tasted really good though. The salsa that they served with it was also really tasty. It has a smoky flavor and we saved it to use on everything else. It added a nice extra dimension to the cheese and tortillas. We did not get any chips, and I am curious to know how they are. If you’ve had them, let me know. The majority of the items on the menu are tacos, so we got a bunch of different ones and shared them. They make all the tortillas in house and it shows. They are really good. The two seafood choices were great. Probably my two favorites. The shrimp one ($4.75) was amazing. 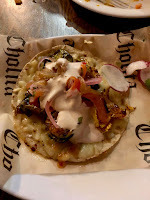 It has bite sized pieces of shrimp (it has been cut up), cabbage, pickled onions (lots of pickled onions here), pico de gallo and baja sauce. I loved, loved the acid from the pickled vegetables. And I don’t know exactly what the baja sauce is, but it was really good. It was a great balance of flavors. The baja taco was also delicious ($4.50). It is a large piece of beer battered fried cod with cabbage slaw, pico de gallo and pickled tartar sauce. Great crunchy taste and again, plenty of acid to make me happy. And did I mention they give you a bunch of limes to squeeze on top too? And not those dried out things you get sometimes. The Brussels sprout taco was probably my next favorite ($4.50). They also offer a fried cauliflower veggie option that is intriguing as well. Next time. Anyhow, the Brussels sprouts version had roasted and grilled halved sprouts with melted cheese, caramelized onions, chili cream, pickled veggies and pico de gallo. Seriously, this was great. Loved the cheesiness. This was one of hubby’s top picks for sure. Really interesting and really well done. Meat-wise, we had the skirt steak ($4.75) and the al pastor ($4.25). I have to say, after the acid and pickled veggies and all the flavor of the others, the meat ones were my least favorite. The steak was good though—it has pinto beans, guacamole, salsa and cactus pico de gallo. It is a hearty one for sure with the steak and beans, and the steak was nice and tender. Lime helped jazz it up. Don’t get me wrong, it was very good, just didn’t wow me as much as the others. 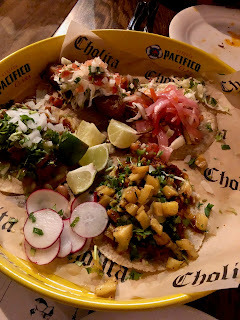 The al pastor had chunks of pork, chipotle salsa and pineapple (which is the classic accompaniment). You’d expect a lot of acid with this mix, but you’d be wrong. For whatever reason, this one just fell a little flat for me. Compared to the others, it was just kind of bland. The pork was well done though and a couple of bite of just the pork showed that it was well cooked and seasoned. I am so excited to have this place in Broad Ripple. Other than a couple of notable exceptions, I feel like Broad Ripple restaurants are just so so over all. 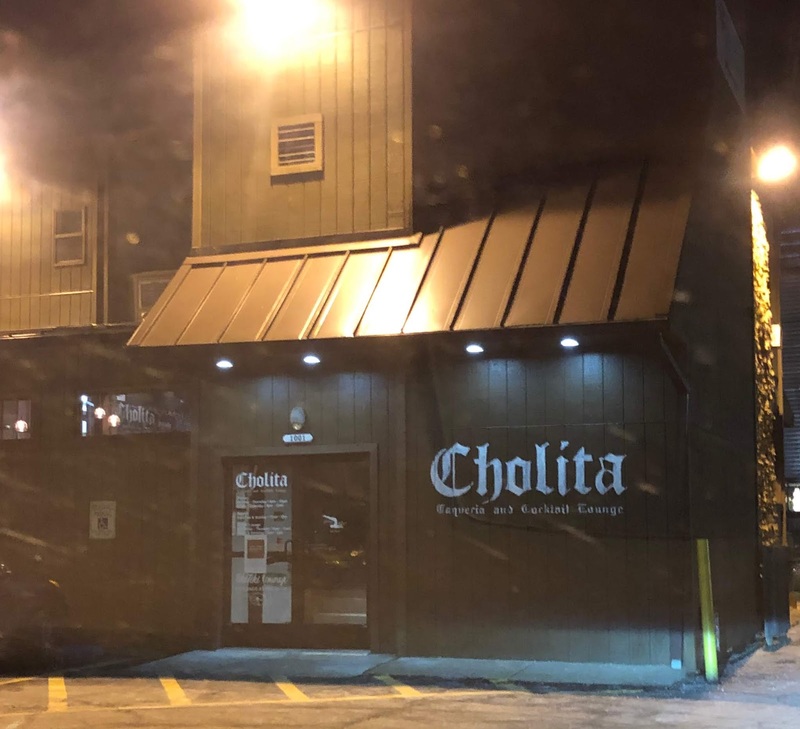 This is a place that will certainly go into regular rotation, assuming they keep quality at the level it was on our visit. Oh, and downstairs, they have a tiki-style bar where you can order the same food, but where they offer a range of more tiki-inspired drinks. It’s cozy and nicely decorated, and I can see sitting down there and eating tacos when the kids aren’t with us. Yay! A new place. It’s reasonably priced and they have tasty margaritas. I can’t wait to taste all the other taco flavors too. If you have been, what have been your favorites? Oh, and they have a mighty fine looking all you can eat brunch menu. I went with the Suadero taco as well. Delish!